Janae Olson tears up after being proudly crowned Ms. MSUM. To her right, Mr. MSUM smiles to the crowd after his cowboy hat gets replaced with a crown. Step aside Clint Eastwood – the real cowboys have arrived at the rodeo. 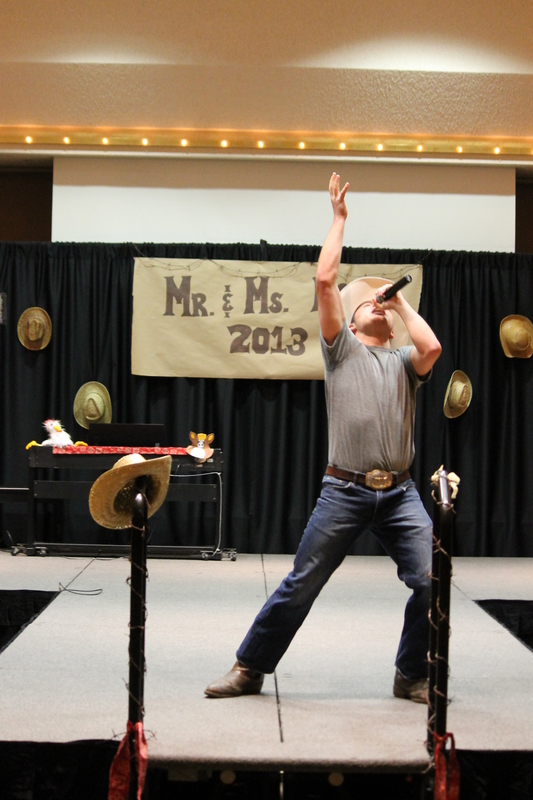 The Dragon Entertainment Group held its 7th annual Mr. and Ms. MSUM mock pageant last Wednesday in the CMU Ballroom. The theme was Western, making the night a hoedown for both contestants and spectators. The program was emceed by “Cowboy Mike,” who wound up being the ultimate entertainer of the night. Three judges presided over the event to choose the winners: Becky Boyle Jones, assistant director of student activities; Annie Wood, assistant direction of communication and student engagement and Briana Schepper, executive director for the Dragon Entertainment Group. The night opened up with the introduction of the cowboys and cowgirls, who sported formal wear with a Western undertone. Jenna Polley, Jenae Olson, Calanthea Mazoyo and Sirine Barrah competed for the title of Ms.; Kasey Anderson and Pat Richard battled head-to-head for the Mr. crown. -Would you rather have a trusty steed or a trusty dog as a sidekick? -Your cowboy rival rolls into town and challenges you to a duel – how do you respond? -If you were a prairie wind, which way would you blow? -While you sit around the campfire, would you play the guitar or harmonica? -What does the coyote say? Mr. MSUM, Pat Richard, sings with country passion on the CMU Ballroom stage. His arms thrown up to the sky during the talent portion of the pageant in hopes of being crowned the new Mr. MSUM. The talent portion was the highlight of the night, though unfortunately none of the contestants used bull riding to showcase their abilities. Among the talents were piano playing, dancing, singing, lip-syncing and trumpet playing. The night wrapped up with a fashion show, with the contestants showing off their country-western ways of style. The audience roared in applause when Richard pulled out a lasso as he strutted his stuff. After a long deliberation, the judges crowned Jenae Olson and Pat Richard Ms. And Mr. MSUM. Although the judges said it was a close vote, they had standout moments from the pageant that sealed the deal for Olson and Richard. “I loved Jenae’s crowd interaction,” said Schepper, referring to Olson’s talent act in which she sang and danced through the aisles of the audience. All in all, the Group considered the night a huge success.